A high performance GPU you can actually afford. Forget the GTX 1080; this is the Pascal GPU you can actually afford. In case you missed our preview earlier this week, the GTX 1070 is coming…next week. As they did with the GTX 1080 launch, Nvidia is staggering the release of information with the retail launch of hardware. On the one hand, it's nice because it means anyone looking to buy a card on day one will know exactly what to expect; however, it also means you can't buy the cards just yet. Spoiler alert: The GTX 1070 is really fast—not quite as fast as the GTX 1080, but it beats the GTX 980 Ti, GTX Titan X, R9 Fury X, and every other currently available single-GPU solution. More importantly, it does this with an expected retail price of $380-$450. But as we suspected with the GTX 1080, all of the cards at launch are likely to be Founders Edition models priced at $450, with custom cards coming later…and that's assuming any of the cards can stay in stock for long. The good news is that Newegg at least has a few cards in stock for the 1080 FE now, at the $700 price point, and since they're all FE models, the only difference is manufacturer warranty and support. Amazon on the other hand only has 'Scalpers Edition' cards priced significantly higher right now. We've already covered most of the technological aspects of the GTX 1070 in previous articles, so if you want to know more about what makes this card tick, check out our GTX 1080 review and discussion of the new Pascal features. The key differences between this card and the 1080 are easily summarized: fewer shaders, slightly lower clock speeds, and GDDR5 memory instead of GDDR5X, which together result in a lower TDP of 150W versus the 1080's 180W. Otherwise, everything that makes Pascal better than Maxwell remains the same, e.g. 16nm FinFET, 8GB VRAM, simultaneous multi-projection, and improved delta color compression. To blower or not to blower, that is the question. One other thing the current GTX 1070 has in common with the GTX 1080 is this whole 'Founders Edition' business. The short summary is that Founders Edition is simply a new name for the reference design, with a blower fan and a metal backplate. Except, where the reference designs on previous Nvidia GPUs were primarily made to help get product on store shelves at launch, the Founders Edition cards will remain available as long as Nvidia continues to sell GTX 1070/1080 cards. What are the potential benefits of these Founders Edition cards? Probably the biggest selling point is that they use blower fans, which makes them a better fit for smaller cases where airflow might be limited. The blowers are also useful in SLI scenarios, but the top card will still run hotter than the bottom card. Note that half of the metal backplate on the cards can be removed for those who want a bit of extra breathing room in SLI. Certainly there are scenarios where having a FE card would be useful, but the pricing does limit the utility of these cards. For the 1080, it's currently creating a $100 price premium for being first in line to upgrade. The 1070 drops the price premium down to $70, but you're still paying more for a card that may not even be the best of the breed. Factory overclocked cards are coming, and those who prefer running a single card and using an open air cooler—not to mention those who want to get lower priced hardware—are advised to wait a bit. Because the Founders Edition will be a retail product, Nvidia had to increase the price, or they'd be going up against their AIB partners. The fact that it also improves profit margins on the initial batches of hardware is purely coincidence, right? (That's sarcasm, if you're wondering.) 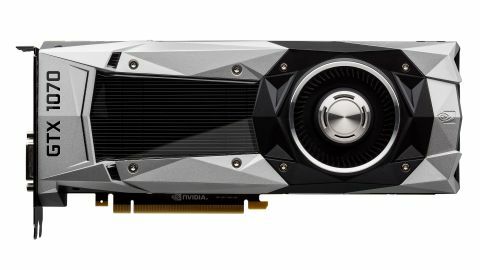 But like it or not, this round of Nvidia hardware is taking a new approach, and we can at least review the card as something end users will actually be able to purchase. The GTX 1070, stripped down to the bare essentials. Earlier this week, we posted a chart showing the overall average performance of the GTX 1070 compared to other graphics cards. We were still collecting overclocked performance results, not to mention working on a Broadwell-E preview, but we're now ready to present our full suite of testing results. We've also retested a few games/cards and changed a couple settings, so the results here are slightly different than our earlier chart. We're using our 'normal' test hardware, an overclocked 4.2GHz i7-5930K. One item that's important to note is that we're using a large case with plenty of ventilation for our testing; I've seen claims that the GTX 1070/1080 are hitting thermal limits and throttling after a few minutes, but in my testing I didn't see that. As an example, I left GTAV running for three hours, testing performance once at the start, once after an hour, and a third time after three hours; the first result was actually the slowest of the three scores, but only by one percent. Does that mean the cards will always run at maximum GPU Boost clocks? No, and that's never been the case on any Nvidia GPU. But if you want to define a higher fan speed target to cool the card better, or tweak the power and thermal targets, you can certainly improve performance a bit over stock. Cutting straight to the heart of the matter, the GTX 1070 ends up being the second fastest GPU in average frame rates, regardless of resolution. It's 9-10 percent faster than the Titan X and 980 Ti, and more importantly, it's 36 percent faster than the GTX 980. (That's running stock clocks on all of the cards, so you can easily close the gap with overclocked cards—we've seen as high as 25 percent factory overclocks on 980/980 Ti cards.) AMD's Fury X is in the interesting position of losing to the 980 Ti at 1080p, tying it at 1440p, and winning at 4K, which means depending on resolution it's either just barely behind the 1070 or as much as 20 percent slower. And how about the GTX 970; we normally advise skipping a generation, and the prices are a bit higher this round compared to the 970/980, but you can get a very respectable 70 percent increase in performance over a 970. Tested using the Extreme preset. One of two games we're testing in DX12 mode, we changed our settings from the GTX 1080 review where we used Crazy on 1080p/1440p and High on 4K. It was a bit weird to have 4K outperform 1080p/1440p, not to mention failing to break 60 fps on almost all cards at 1080p, so we retested at Extreme across all resolutions. This is one of the few games where the Fury X can match the 1070, though it's effectively a tie. As for DX12 vs. DX11, Nvidia often loses a bit of performance (1-3 percent) compared to DX11, though DX12 helps with multi-GPU. Tested with max quality, 4xMSAA, no PhysX. 1080p/1440p tested using Ultra preset; 4K used the High preset. Tested at Ultra with SMAA. Doom seems to like memory bandwidth, which as we'll see later means good things for overclocking VRAM. We're also still waiting for the Vulkan patch for the game, which AMD and Nvidia have both talked about, so hopefully it won't be biased toward one side. Tested using the Ultra preset. Tested using the Ultra preset with the HD texture pack. Tested using DX12 mode with SMAA; 1080p/1440p used maximum (High/Ultra) settings while 4K used High. Our second DX12 game, not all cards do better in DX12 vs. DX11, but AMD benefits, and Nvidia's newer cards do as well, if only by a few percent. The engine clearly favors AMD right now, though, with the Fury X able to outperform the 1070, the only time we'll see this happen. Tested with 4xMSAA and Ultra preset. All settings at max but without SSAA of Advanced PhysX. Despite being a rather old game, Metro: Last Light remains rather demanding at maximum settings—even without PhysX or SSAA. This is also about as close as the Titan X and 980 Ti get to matching the 1070, tying in frame rates at 1440p and 4K. DX11 mode; 1080p/1440p at Very High with MSAA; 4K at High with FXAA. Last time we checked (a few weeks ago), Rise of the Tomb Raider still performed better with DX11 than DX12 on all GPUs—AMD as well as Nvidia. It feels as though it was more of a proof of concept rather than a concerted effort to do something useful with the new API. Tested using DX11 and Ultra settings with 'Unlimited' (native) rendering resolution, and with 4xMSAA. Much like Rise of the Tomb Raider, The Talos Principle adds support for a low-level API, this time Vulkan instead of DX12. Unfortunately, while the game generally runs okay using Vulkan, performance is slower than the DX11 mode, so we've stuck with DX11 for now. Tested using the Ultimate preset. Tested using Ultra preset but with HairWorks turned off. The Founders Edition cooling is good, but we expect custom designs to be quieter if you don't want a blower fan. Stock performance is all well and good, but everyone wants to see what the new cards can do with a bit of fine tuning. As with the GTX 1080, we used EVGA's Precision X16, but the per-voltage tuning still isn't working quite right—hopefully a public release that addresses this will come sooner rather than later. So we settled on a linear overclock, and just like the GTX 1080, our card could do about +200MHz on the GPU core, and not much more. In fact, a few games (Hitman and Ashes) both crashed at +200, but they ran fine at +190. As with all overclocking, your mileage may vary. Here's where things get interesting. The 1080 uses GDDR5X memory, which transfers four bits per clock compared to two bits per clock on normal GDDR5. The GTX Titan X and 980 Ti used GDDR5 running at 7010 MT/s (3505MHz with two bits per clock), and we were often able to hit 8000-8400 MT/s. With the 1070, Nvidia has increased the GDDR5 clock to 4000MHz (8000 MT/s), so that's already pretty close to our previous limit. We didn't really expect to be able to push much further, whereas on the GTX 1080's GDDR5X we were able to reach 11500 MT/s. Well…turns out the 'craftsmanship' Nvidia talked about at their Pascal Editors' Day comes into play on GDDR5 clocks as well. We pushed the VRAM up by +250 and then +350 without incident. Next was +500MHz, or 9000 MT/s, a new record for GDDR5 speed in my experience…and the card still ran flawlessly. At this point, I actually questioned Nvidia on whether or not the 1070 was actually using GDDR5X, since GDDR5 requires a different PCB; they said it's really GDDR5, and there's no reason to lie—using GDDR5X would actually be something to advertise, not hide. Throwing caution to the wind, I tried maxing out the memory overclock at +1000MHz, and finally crashed, to my amusement. But dropping to 750MHz was nearly stable (a few graphical glitches followed by an eventual crash), and I finally ended at +700MHz—9400 MT/s. That's a 17.5 percent memory overclock, and over 10 percent higher than our previous best GDDR5 speed. Nice! Here's what we ended up using for our overclocked settings (this image was captured while running Rise of the Tomb Raider in a Window, so those are real-time clocks and temperatures). Notice that we've set the power/temp target to the maximum of 112%/91C, with fan speed to a static 85%. A custom fan curve would have been better, but this preview build of Precision X16 doesn't support custom fan curves. By default, Nvidia seems to be targeting lower noise rather than maximum performance, so you'll see lower clocks after a few minutes if you don't manually increase the fan speed. We hit our overclock with temperatures staying less than 65C, but leaving the fan on "Auto" would periodically crash and GPU temperatures could exceed 80C, not to mention larger fluctuations in GPU clocks. The extra 200MHz on the GPU clock might not seem like much, but with the other adjustments we're typically seeing clock speeds of 1950-2000MHz. At stock, the typical boost clock is ~1650MHz, so all told we end up with about 20 percent higher core clocks, with 17.5 percent higher VRAM clocks. It's not enough to close the gap with the GTX 1080, but we do see about 15 percent higher performance on average (less at 1080p where we bump into CPU bottlenecks). And there you have it: fifteen games tested, covering a variety of game engines and genres. Out of those games, the GTX 1070 manages to match or exceed the GTX Titan X and GTX 980 Ti in every single title. And it does so while potentially lowering the entry price to $380—though it will almost certainly be a month or so before we see such prices readily available. And if you're willing to overclock, you can add about 15 percent more performance, which is pretty similar to what we've seen with GTX 1080 and slightly less than the reference GTX 980 Ti. But even $380—never mind the expected $450+ prices we're likely to see at launch—is a lot of money to spend on a graphics card. Is the GTX 1070 worth that? It depends on the user, but we can provide a bit more insight on the relative value. We've rated the cards in terms of bang for the buck, or FPS per dollar spent on the GPU. That doesn't account for the cost of the rest of your system, obviously, but it's a start. Using the $380 MSRP, the 1070 ends up being a better value than all but three cards, and those cards are only a slightly better value but with far lower performance. The 1070 is over twice as fast (on average), allowing for higher resolutions and higher quality settings. Until we see additional new GPUs, Nvidia clinches the top two performance spots with the GTX 1080 and GTX 1070. That doesn't mean you need up upgrade, of course—even a GTX 950 (the slowest GPU we tested for this article) handles most games at 1080p High at close to 60 fps. But if you're looking to upgrade, not surprisingly, all the new GPUs are supplanting the previous generation models. It's the evolution we expected to see when GPUs moved from 28nm to 14/16nm; hopefully the next process update won't require quite so long. For the performance conscious, the custom (non-FE) versions of the GTX 1070 are the cards to beat, as they'll handle everything up to 1440p Ultra without too much trouble, and they're better at 4K in most cases than the previous generation heavyweights (980 Ti and Fury X)…but you'll still need two cards in SLI if you want to consistently break 60 fps. AMD's Fury X beats the 1070 in one instance, and it's a Gaming Evolved release at that: Hitman, in DX12. Even if all DX12 games were to follow suit, there just aren't enough of them right now to balance out all the clear wins in DX11 games. However, we're not done with the new GPUs just yet. Those who want something priced even lower than the GTX 1070 should keep their eyes on AMD's upcoming RX 480, which should also show up in other Polaris 10/11 cards. The RX 480 will start at $199 and is launching on June 29. We don't have benchmarks yet, but all signs point to this being an amazing bang-for-the-buck card. And if you're waiting for the GTX 1070 to hit non-FE prices anyway, there's no rush. Check back again later this month when we'll wrap up this story…at least until the fall when we expect to see additional new GPUs come out.